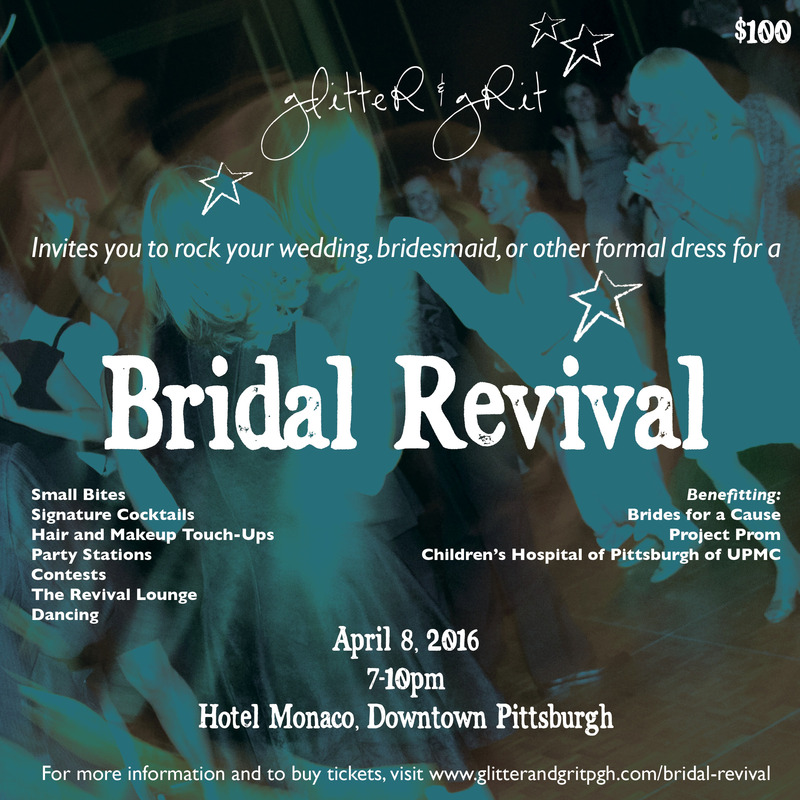 Donate your wedding dress at Glitter & Grit’s “Bridal Revival” event on Friday, April 8 at the Hotel Monaco Pittsburgh! Glitter & Grit’s Bridal Revival is the chance for you to wear your wedding dress again, and really enjoy it this time. No pre-ceremony jitters, no shaking hands and kissing babies; just a fun night out with girlfriends, looking fabulous and having a blast! After it’s all over, there’s an opportunity to do some good. They will be accepting wedding and bridesmaid dress donations for us (Brides for a Cause) and Project Prom. Additionally, all proceeds derived from the event will be donated to Children’s Hospital of Pittsburgh. You are invited to join in the fun by rocking your wedding, bridesmaid, or other formal dress! Tickets to the Bridal Revival include small bites, signature cocktails, hair and makeup touch-ups, party stations, contests, access to the Revival Lounge, and (of course) dancing! Hotel Monaco will be offering discounted room rates for attendees of Bridal Revival if you want to go all-out and stay the night. Make your reservation through this link or reference the “Bridal Revival Room Block” when you call 855-338-3837. Donation forms will be available at the event! Visit www.glitterandgritpgh.com/bridal-revival for more information!